One of the most frequent questions we get as Microsoft MVPs is "How do you stay on top of everything going on with Dynamics 365?" and the truth is that having the time to do it is just the beginning. You must have the right tools and "accessibility" to the information in addition to the time. As MVPs, we get to see and hear about what Microsoft is doing months and sometimes years before partners and customers do, so we have more time to assimilate the information and play with the functionality in addition to early access. So this year I'm starting a new monthly video series aimed to help EVERYONE stay up to date. Each month I will share what happened in the world of Dynamics 365 so you don't have to spend countless hours trying to find the information. As always, if you enjoyed the video, please subscribe to support our channel and share the news amongst your team and local chapters members. Readiness is a very important factor when it comes to long term success of Dynamics 365 within an organization, so I hope these videos help provide some clarity for the community. Thanks for the great recap of what is on the horizon! One thing I heard when you were discussing Power Apps was that you can set the new UI as the default UI. We are very close to rolling out CRM to a much larger audience and I would like to get to the new UI prior to that roll-out (so we fon't have to introduce a change shortly after they learn the traditional UI). I am trying to figure out the easiest way to get the URL to them. In some documentation from Microsoft, they suggest having the users sign in to office.com and then navigate to D365. In the past I have always provided the URL. How would we transition to the existing users to the new UI? Just send the new URL? Thanks for your feedback and I cant wait to hear the update next month! 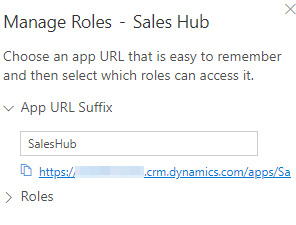 @Laura Mortick - Since you are transitioning to the new UI, you can actually define a custom suffix to the core/root URL of your Dynamics 365 site. This will allow the users to have a simpler URL to either remember, or save in their browser bookmarks. 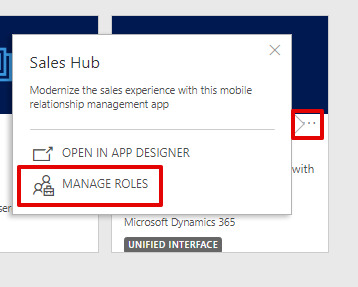 Locate the correct Unified Interface app and click the 3 dots in the corner, and select "Manage Roles". 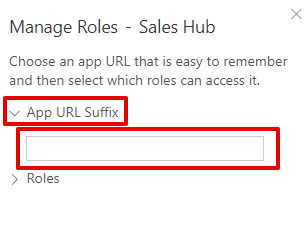 Expand the "App URL Suffix" section and fill in the field with the name of your suffix. You will notice that the suffix now has "/apps/SalesHub".